Trees are not only beautiful to look at; they also serve important purposes in our communities and all over the world. They provide the oxygen we breathe, regulate the temperature of our neighborhoods, provide food and shelter for wildlife and add value to our homes. 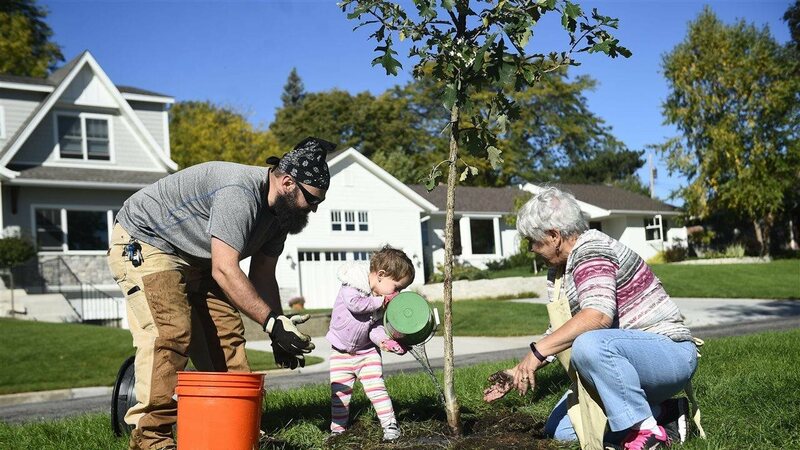 If you’ve ever wanted to plant trees in your own yard, or if you want to join a community tree planting project, Arbor Day is a great time to get started. National Arbor Day is celebrated on the last Friday in April, this year falling on April 26. There may even be Arbor Day events happening in your community. You can find out a CelebrateArborDay.org. Tree planting is a great opportunity to involve the whole family, teaching your children the importance of the natural environment and how we can all be better stewards of our planet. Below are some tips for a successful tree planting. 1. Location, location, location. Where you plant a tree matters. Tall trees should be planted far enough from utility lines (and homes) to avoid problems when they grow to maturity. Shorter flowering trees may be a good choice closer to utility lines. Large evergreens shouldn’t be planted close to a house on the southern side, as they can block warming winter sunlight. However, planting trees to the north of a house can help shield it from cold winter winds. 2. Choose your tree with care. The Arbor Day Foundation can help you find the right variety of tree for your climate zone, soil conditions, sun exposure and location. Visit arborday.org/trees for guidance on choosing the right tree for your purposes. 3. How to start your tree. Whether you start with a bare-root seedling, a balled and burlapped tree or a container-grown or potted tree, be sure it looks healthy. For a bare-root tree, look for abundant root growth, numerous small fibrous roots that appear moist and a good color. A balled and burlapped tree should have a firm soil ball that does not seem broken, without circling roots at the base of the trunk. Always carry these by their soil ball, not from the trunk, stem or branches. A containerized tree should not be root-bound in the pot or can — if roots have circled around the edge of the container, you should cut any circling roots before planting. Always remove any container before planting. Balled and burlapped is the preferred choice for larger trees. 4. Plant properly. Watch the videos at arborday.org/howtoplant to see the best practices for planting bare-root seedlings, balled and burlapped trees or containerized trees. Tips for all three types include: digging a hole wider than what seems necessary for your tree, packing the original soil around the planted tree firmly but not too tightly, creating a water-holding basin in the soil around the tree and giving the tree a good watering, then keeping the soil around the tree moist but not soggy, watering every 7–10 days during the first year after planting. 5. Continuous care for your trees. For your newly planted trees — and even existing trees on your property — help them thrive by watering them correctly (which is especially important when conditions are hot and dry), adding mulch, pruning as needed and watching for issues such as pests or tree diseases. The time for planting trees is now. By doing so, you are an important part of something bigger. The Arbor Day Foundation’s Time for Trees initiative aspires to plant 100 million trees by 2022, the 150th anniversary of Arbor Day. Each tree planted will help clean our air and water, fight climate change, prevent damage from storms and flooding and beautify our world. Enhance your yard, your community and the planet by planting a tree this Arbor Day.